The never-ending case of Oscar Pistorius reached a new twist Thursday, when a South African appeals court overturned his lesser conviction of “culpable homicide” and convicted him of murder. Pistorius, who was recently freed from prison and placed on house arrest, now faces a 15-year sentence. Pistorius served less than a year of a five-year sentence on the homicide charge before being sent to do very hard time in October at his uncle’s mansion. The appellate decision has been anticipated for months; as the New Statesman explains, the greater conviction is based on a legal precedent that finds someone guilty of murder when they know their actions will lead to the death of another person, but continue regardless. Pistorius shot girlfriend Reeva Steenkamp four times through a closed bathroom door in 2013, and has maintained he believed there was an intruder in the house. Chief appeals court judge Eric Leach ruled that Pistorius would have known that shooting through the door would have killed whoever was behind it. The next question is whether Pistorius can appeal this ruling too; the consensus seems to be that he can, if there are “extenuating circumstances” in the case, and that even if the 15-year sentence stands, he may not serve all of it. He is expected to be sentenced early next year. 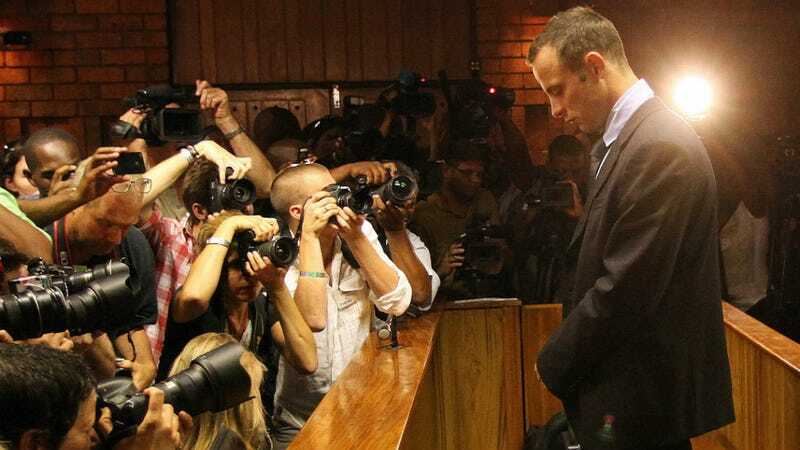 Pistorius is still serving his house arrest at his uncle’s home in Pretoria and didn’t attend the hearing. According to the Telegraph, Reeva Steenkamp’s mother June “let out a sigh of relief” when the ruling was read.